August Catering & Events is a boutique catering company located in the heart of New York City. Jennifer prides herself on cooking delicious, beautiful food and being adaptable and creative. She never loses sight of the fact that her clients’ satisfaction comes first. You know good food when you see it. But it takes more than just delicious food to execute a memorable event. Behind each bite, each dish, is something you can’t see—the intricate dance between the kitchen and the waitstaff to get the food to your guests without a hiccup. The dedication of every member of our staff to making the client and the client’s guests a top priority. The cumulative years of experience both in the kitchen and on the floor. The careful crafting of menus that complement the vision of each event. The operational excellence that enables us to remedy any issues before the client even perceives a misstep. And certainly not least, the love and passion we all put into our work. We hope all of these qualities come through for each and every client we serve. August's team is made up of some of the best chefs and service professionals in the business. Our chefs are graduates of prestigious culinary programs and have perfected their craft in the trenches of the most renowned New York City restaurant kitchens. 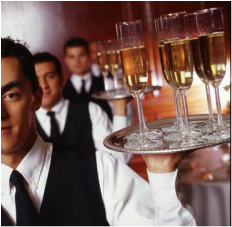 Our service staff has years of fine dining and high-end catering service experience. Our excellent teams work together seamlessly to ensure that your event is a success.